After years of working as Passports: The Art Diversity Project, the two grassroots organizers--Christine Bethea and Brenda Brown-- are going to redirect their artistic roots. Over the last several years, the group has been focused mainly on arts administration, concentrating on special events such as the Geek Art/Green Innovator's Festival @ Unblurred on Penn Avenue, which they produced and which has had a successful six year run. Said Bethea, one of Passport's former principals," We are looking forward to being what we are first and foremost: Artists. We want to get back to creating art ourselves, and in particular expanding by doing more public art and utilizing other established and emerging artists. 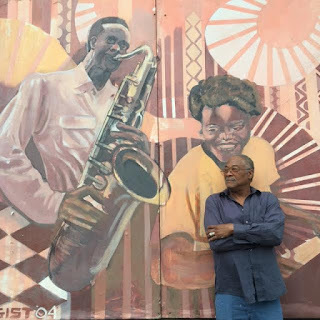 Joining the Bethea and Brown as a lead artist, will be Hill District icon, George Gist who, since 1967 has created murals and other art in several rust belt cities including Pittsburgh and Detroit. Gist's work on the New Granada is one of the city's first public mural projects. "We feel George, his art, music and history bring a lot of dimension to the group," said Brown. GA/GI or the Geek Art/Green Innovator's Festival has grown to become the main event that Passports Art Diversity Project (PADP) produces, held in April of every year as part of Unblurred on Penn. Now up four years from our first, we are now directing, GA/GI 5! Visit here. Passports will be hosting their annual meeting this December to look at other events and possibilities to benefit Pittsburgh's artists. Once again, Passports/ARTica in partnership with Penn Avenue Arts presents GA/Festival! Our 3rd big year...learn about it here. The evening of Thursday, August 18, Passports was proud to deliver a quilt created by Christine Bethea to the Roberto Clemente Museum curated by photographer, Duane Reider.. It took one year to complete the work. Both the museum and Ms. Bethea's organization Passports are supported by Pittsburgh Gateways. Adding tech assistance were artists, Brenda Brown and Susan Constanse. 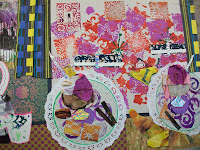 To see other work by Ms. Bethea, an award winning quilter, registered with the Heinz History Center, visit Quilter's Candy. Passports/ARTica Ends and Begins Another Great Year! We're proud of all our accomplishments in 2010. Some of the best being the creation of Pennsylvania's first Eco, Art and Tech Festival--GA/GI (pronounced GAH-gee) as a key event of World Environment Day. Our Green Team helped a number of emerging artists move forward in their careers.through exhibiting and doing demos at the event. This year, in addition to the festival, we've teamed up with Pittsburgh Gateways to build a fiberarts business that will produce a series of fiberart quilts based on the history of Pittsburgh's Hill District. 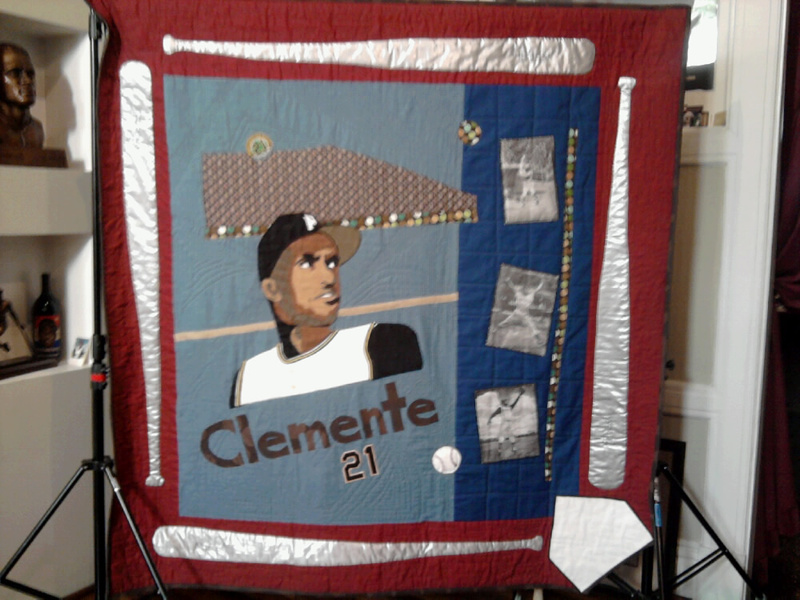 And we're working with the Roberto Clemente Museum to complete a quilt for fundraising. 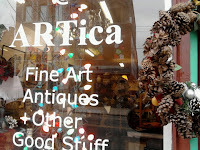 Meanwhile the ARTIca shop will be totally overhauled by Grove City Student Sam Perry. We've put out a call for artists to program it for the upcoming year, looking forward to showcasing fiberartist Cathleen Bailey in June with an exhibition called "Sparkle. "So many great ideas! We'll keep you posted. "Welcome To SamSamland: Don't Wear Black to My Funeral" will be a gallery and music event curated by Sam Perry of Grove City University. SamSamland's key focus is the balance between celebrating and mourning life. This will be done through the exploration of trauma and its effect on the individual and community. SamSamland serves as a freeing space for victims of trauma and their family and friends as well as an educational experience for all those involved. Recycled materials will be used for all of the pieces, showing that beauty can be created out of everyone's damaged goods. 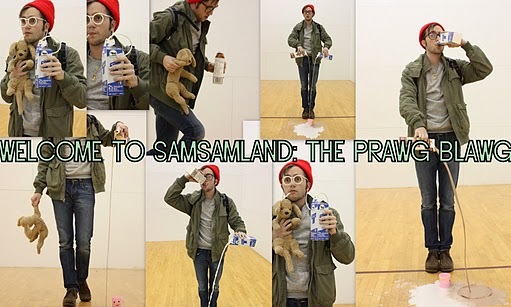 For more information, check out samsamland's blog or search "Welcome to SamSamland" on Facebook. 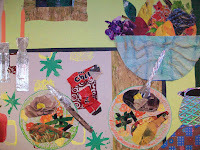 Passports has been working with Life Pittsburgh for three years to produce art created from recycled items! 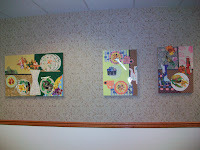 Seniors have stamped vintage fabric, rolled paper beads made of magazines and wrapping paper, repurposed old string, sewed, pasted and collaged their way into producing many incredible works of art for the walls and common spaces of several local senior day cares. 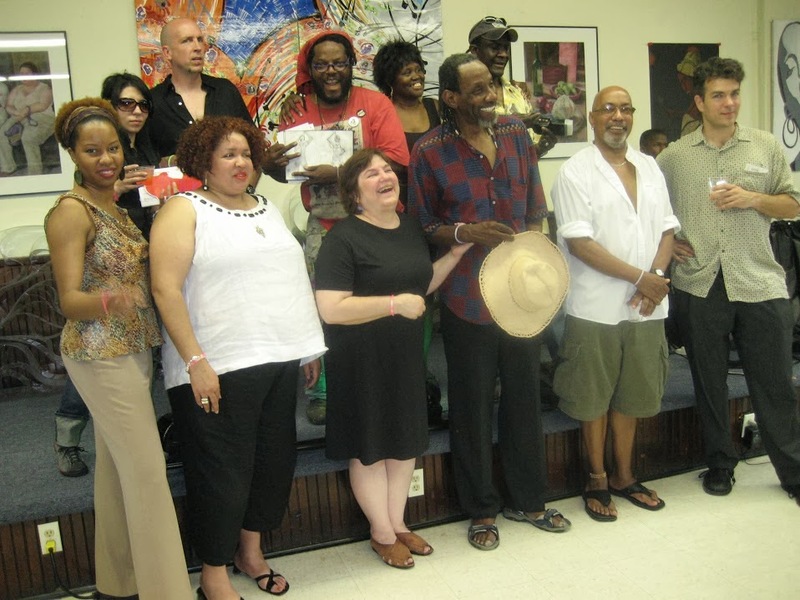 Other Life Centers hosting art by Passports are in the Hill District and on the North Shore. The Organization founders, Christine Bethea and Brenda Brown, have plans to work with other companies that cater to the senior population in the region, in the near future. 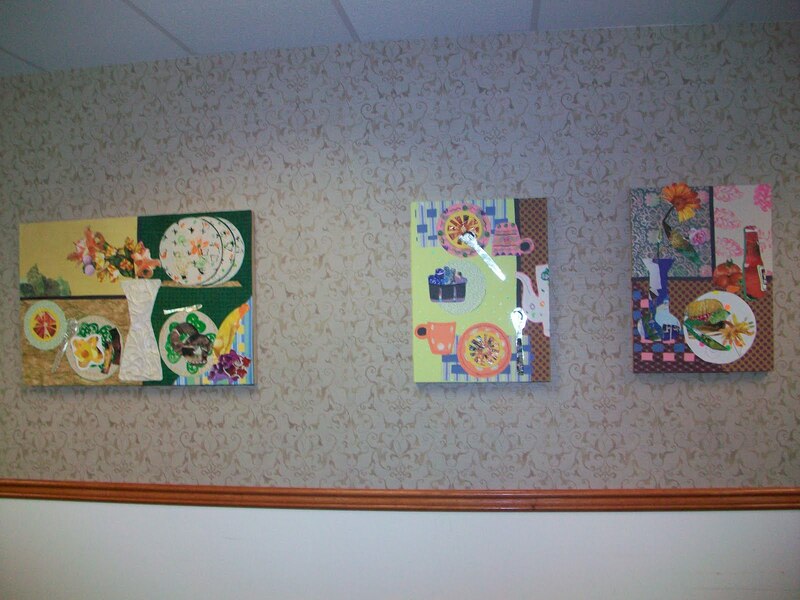 Shown here: Panels gracing the dining room of Life's Senior Center in Green Tree. Sample Interiors and Exhibitions by Passports...Just Add Art! Artica is always looking for new artists for upcoming exhibts and in-house displays. Call for an appointment to have us review your art. 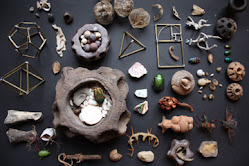 Art must be picked up in 30 days from the end date of any show or exhibition or art/sculpture/ installation et. 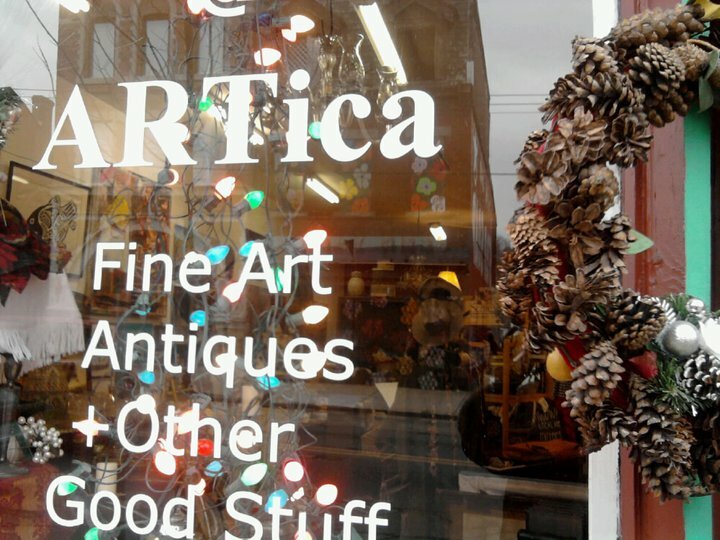 al becomes the property of Artica Gallery and its owner. It our stuff's outside--We're inside! Also see us by appt because we're out advocating for art in Pittsburgh! To enlighten, empower and enrich community through the arts. Support for diversity in the arts and artists of diverse abilities in Southwestern Pennsylvania. Engage partners from private, non-profit and governmental sectors in creating arts awareness and job opportunities for artists. Enrich and educate youth and community through on-going arts collaborations and innovative cultural projects. Promote the use of artistic innovation in the green and technology industries. Passports Recognized by The Greater Pittsburgh Arts Council! An organization of artists of many disciplines located in Southwestern, Pennsylvania. ARTica Gallery and Antiques is a collaborative which supports Passport's projects and the efforts of emerging and underserved artists. Friday, April 2 of 2010, the GA/GI (pronounced GAHgee) is Geek Arts and Green Innovators Festival-- the first arts and technology fest in the city of Pittsburgh with Passports Art Diversity Project serving as organizer and promoter. "We're excited to be doing this for the city," said Brenda Brown, Passports Co-founder. "It's high time, we showcased what this city has to offer in technology and ecology on a level where average people can see it, touch it and get involved. "Instead of taking the festival to some lofty downtown site, Passports plans to utilize a popular monthly art crawl in the east end of Pittsburgh known as "Unblurred" for the event venue. Unblurred pulls its audienace from all over Southwest Pennsylvania with several neighborhoods within walking or bike riding distance distance. Plans for events include a fashion show with Eco wear and LED-lighted clothing, an Art Robots Show; technogy exhibitions, a fuel efficient car show, and vendors from a variety of eco-friendly companies.For additional information on how to get involved visit the GA/GI site. or e-mail passports.art@gmail.com.